It is blister beetle season again! 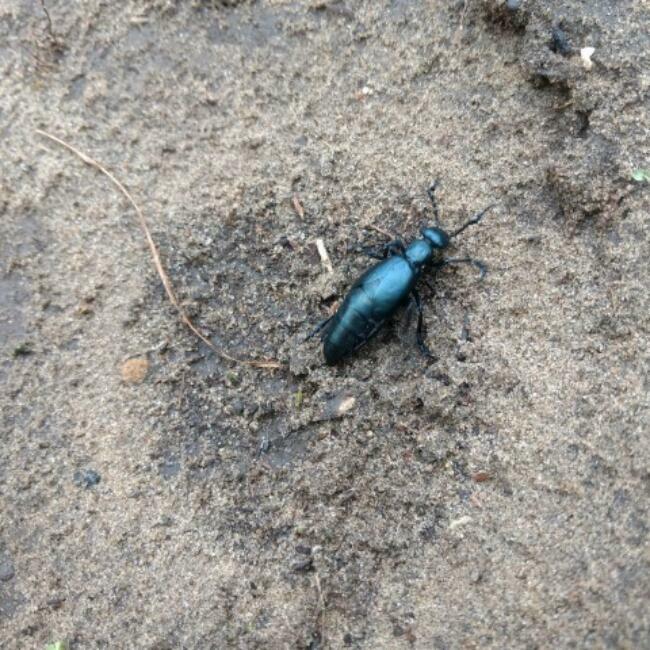 In certain areas of High Park these metallic dark blue “blister beetles” are slowly ambling along the sandy ground. When disturbed, adult blister beetles exude a defensive yellow oil (cantharidin) that can cause painful blisters on human skin. The story of how blister beetle babies find their food is one of staggering strategy and deceitful disguise. The blister beetle larvae disguise themselves as a female solitary bee by clumping together. When a male bee comes to mate with this “bee” it transfers those tiny blister beetle larvae to a female bee who unknowingly delivers the larvae to her underground burrow where she busily lays her eggs and brings provisions. The blister beetle larvae then consume the nectar and pollen as well as the solitary bee larva. Mature blister beetles emerge in early fall. Interestingly, we find blister beetles in similar areas that we find ground-nesting solitary bees.